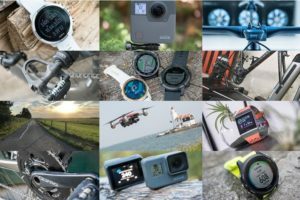 For each of the last three years or so, I’ve started the review process of a Samsung GPS watch, all variants of either the Samsung Galaxy line or Samsung Gear lineup. And each of those years I get a few workouts into it and remember what a complete nightmare it is to get data off of the darn watch. Or more specifically, out of the Samsung app that accompanies the watch. This year with the Samsung Galaxy Watch Active, the story is no different. See, while most companies make it relatively painless to download completed workout files – Samsung takes the opposite approach. They make it darn near impossible, depending on whether you’re on iOS or Android. And even on Android getting a file with HR data included is tricky business too. 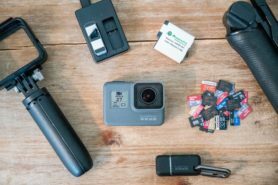 When I’m talking files, I’m specifically talking about something you can download to your computer and then load onto various fitness apps/platforms. Common file formats like .FIT, .TCX, and even .GPX. While .CSV is considered a file format, it’s not a fitness one. No worries, that’s not a concern here since Samsung doesn’t use .CSV anyway for S Health. Note that this post is definitely not a review of the Galaxy Watch Active (or S Health aka Samsung Health). It’s basically just a quick how-to guide on a single topic that seems to perplex many. My actual review of the Samsung Galaxy Watch Active will come late next week, after I finish collecting a bit more data. 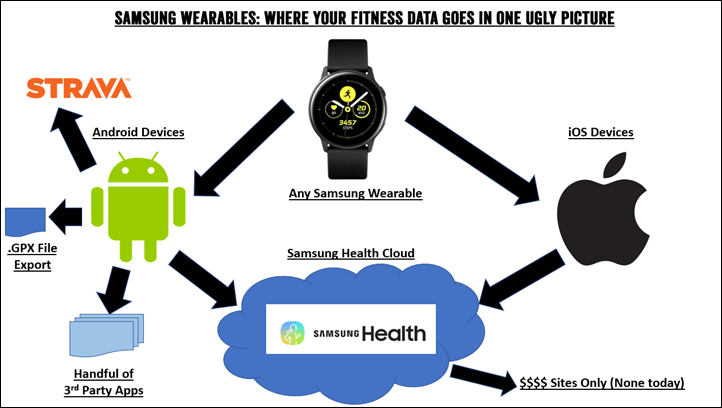 Now, a super brief graphical overview of how the Samsung watches work from a fitness file standpoint. Got all that? Good, we’ll probably refer to it a few times. As one might expect, the Samsung watches generally have more features when paired to an Android phone than not. 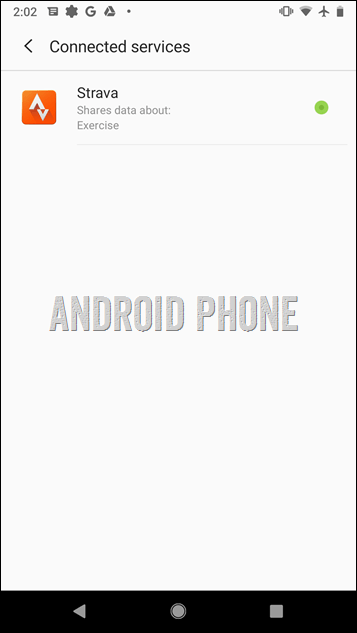 In fact, that even gets taken a step further for Galaxy phones vs a vanilla Android phone in certain features. But for the purposes of exporting data out of the watch, it’s equal. 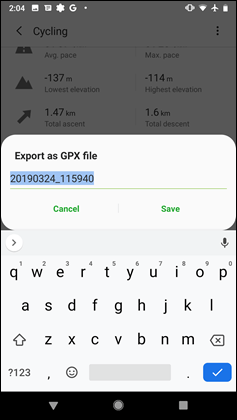 A) Use the .GPX export option from within Samsung Health: This mostly works fine for doing it one file at a time, except one catch: It doesn’t export your heart rate data. While the .GPX file format supports HR data just fine, Samsung elected not to put it in there. If you don’t care about that – then by all means, use this option. B) Use 3rd party sync tools to export data from app to interwebs: There’s two main options here I’m aware of – FitnessSyncer and SyncMyTracks. 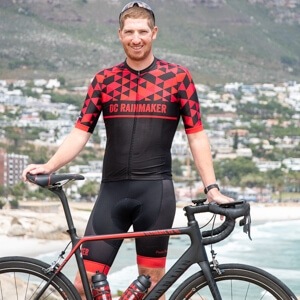 Both do basically the same thing: They get your data off of the phone and up to 3rd party sites like Garmin Connect, Strava, Dropbox, and countless others. Once you use these apps, your data is free as a bird. And it’ll include HR data too (at least with FitnessSyncer that I’ve tried). C) Sync to Strava (this is the half option): In this option you can enable Strava sync for your workouts, and then download that file after the fact from Strava. Be aware that this only works for data synced directly from the watch to your Android phone and then to Strava. If you’re looking at this option from the perspective of an iPhone user, it won’t work (more on that in a moment). In addition to these methods, there’s also the nuclear option: GDPR. 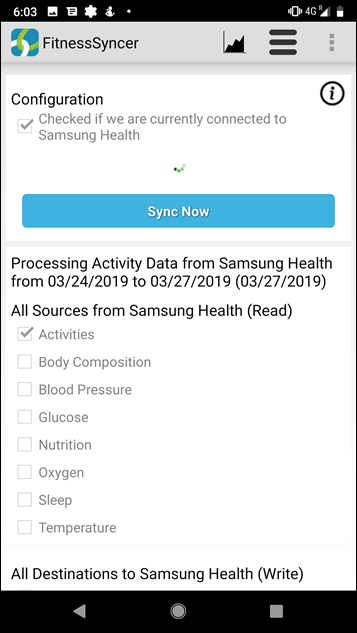 Samsung does allow you to submit a request for all your data that they have on their platform (synced to the Samsung Health Cloud). The challenge there is that once you stumble through their automated process, you get a ZIP file back with a crapton of mostly useless JSON files. They aren’t in a fitness format that any site would understand. So you’d have to write a parser to undo that situation. Thus, like a nuclear bomb – it technically works but is also a complete mess. So, let’s just do a quick run-through of those first three options. Just for the fun of it. Export as GPX: First up, using the .GPX sport feature within a given workout. To do this you’ll go to the activity you want to export and then open it up. Slide all the way to the bottom and then select ‘Export as GPX file’. After that, it’ll ask you what you want to do with it. I’d just e-mail it to yourself and then upload it manually to wherever you want. Next, you’ll need to export that data somewhere. 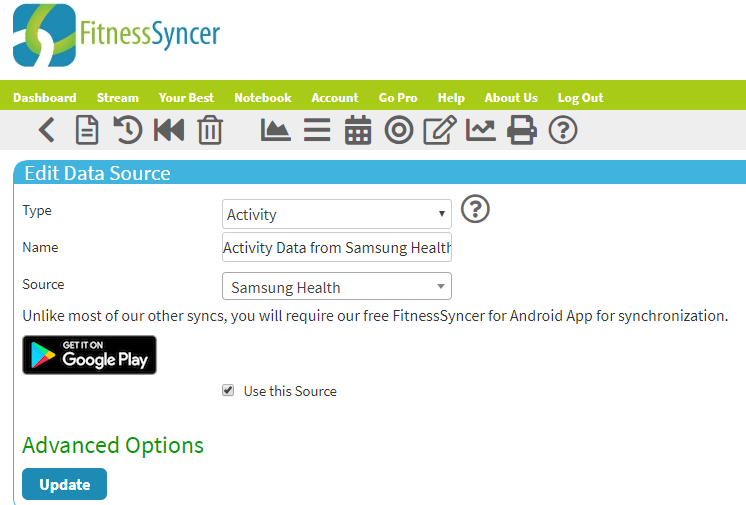 FitnessSyncer has basically two things it does in life: Pull data in, and push data out. You just tell it where to push and pull to. Now here’s the thing: I strongly recommend you don’t get fancy here. Just export it out to one place for now. And don’t set up multiple imports. The last time I did that my house of cards fell down. Likely my fault, but just keep it simple for now. Then later on when you get cocky you can break your own house and it won’t be my fault. You can add filters and such for dates or titles or anything you want. 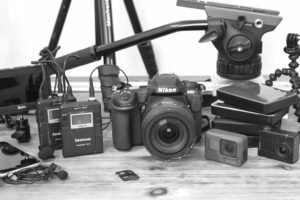 Again – keep it simple until you’ve got it working. 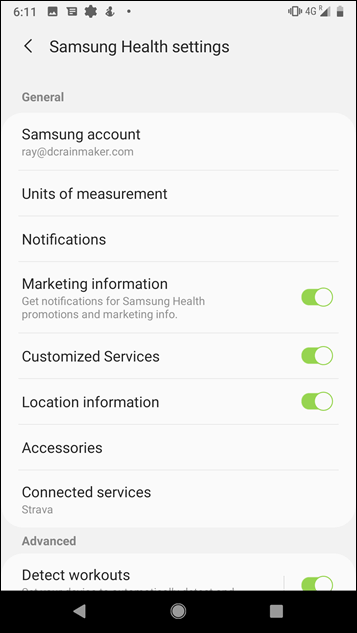 Note that the Samsung watches don’t natively connect to sensors, so that type of data export isn’t really an issue here. Do note that there are some oddities however between the data from Samsung Health GPS export versus that of using the Strava sync option, including distance/time/elevation, which does, in turn, impact some Strava effort metrics. 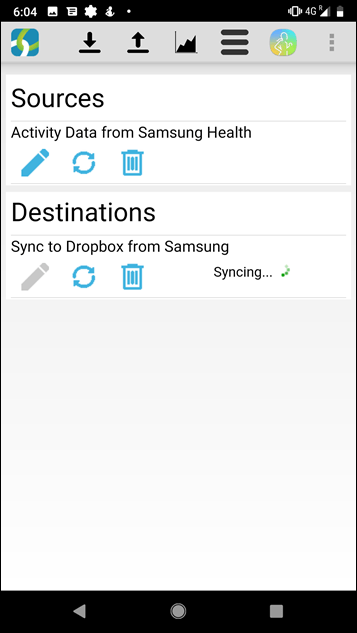 Interestingly, there used to be way more options for platforms Samsung sync’d to, but they’re all gone these days. It’s just Strava, and only Strava. Either way, at least if you’re on an Android phone you can get your data out. Sometimes one escape route is better than none. 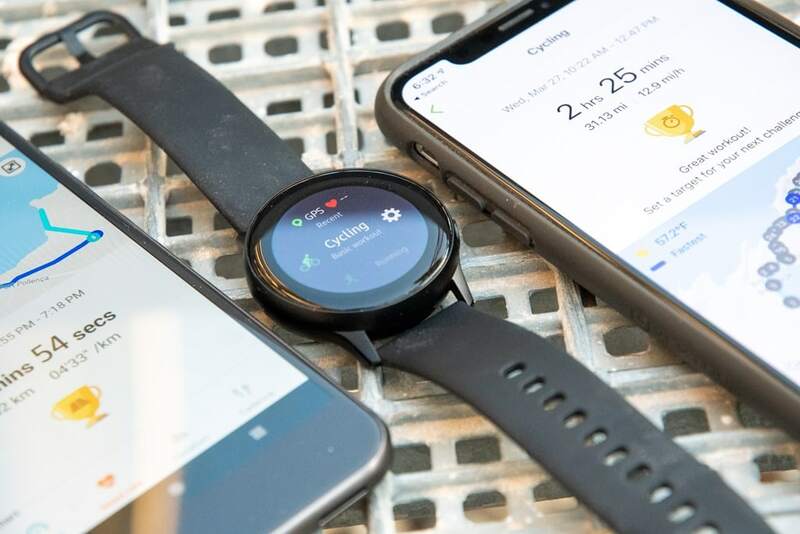 I’m going to be the bearer of bad news here – but the simple reality is that without an Android phone you won’t be able to download any workout data files from your device. 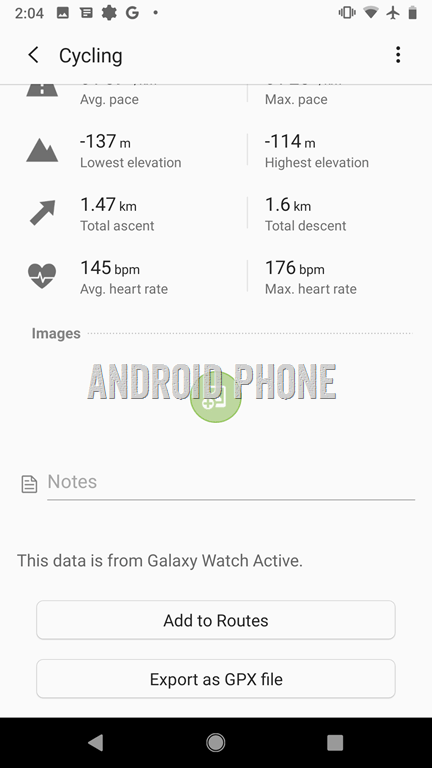 At least if you recorded that activity using the native Samsung workout apps on the Galaxy watch. 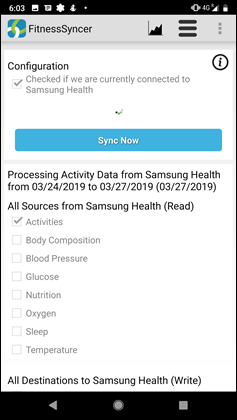 That data goes into Samsung’s Samsung Health app on your iPhone and then up to Samsung Health cloud. However, there’s no mechanism on the iOS app to download workout files (even partial ones). In fact, unlike the Android app, you can’t even connect the Samsung Health to Strava. It’s simply not an option. 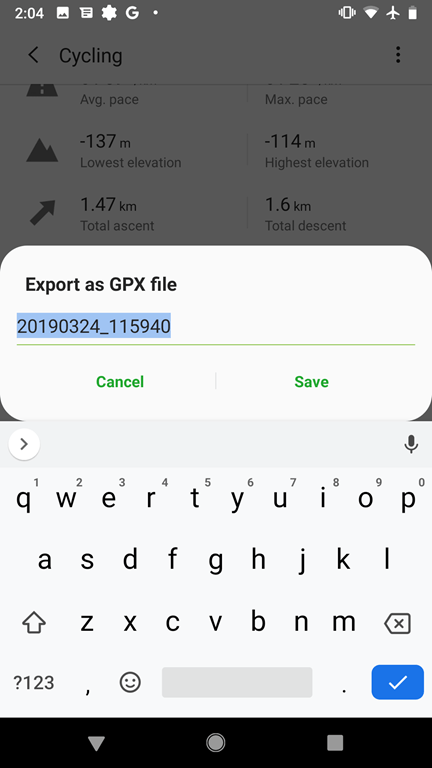 Just like there is no option to export data as .GPX files like there is on Android. This has been this way for years, since the days of the Gear Sport and prior. The *only* option you’ve got that doesn’t involve an Android phone is the GDPR request to request all your data. But as I outlined in more detail up above in the Android section, that just gives you a pile of mostly useless non-fitness formatted JSON files. Sure, the data is in there, but good luck doing anything with it unless you spend a bunch of time writing scripts to manually parsing that data. And if there’s anything I’ve learned in doing this more than a decade it’s that when it comes to parsing fitness files: It’s really hard. I’ve no doubt someone on GitHub probably has a parser somewhere for these files. But it often takes companies years of work to get their files perfect and compliant according to standards. It’s the edge cases that kills them. Silly things like how to deal with data drop-outs in tunnels or weird 0,0 lat/long type bugs. Things that most DIY parsing scripts won’t likely have handled properly. Which isn’t a slam on them – it’s a slam on Samsung: Just offer your .GPX export option on iOS. Or, get all modern and offer .TCX or .FIT like everyone else. Your only hope – using a 3rd party app to record workouts: For iOS users, this is really the best bet. 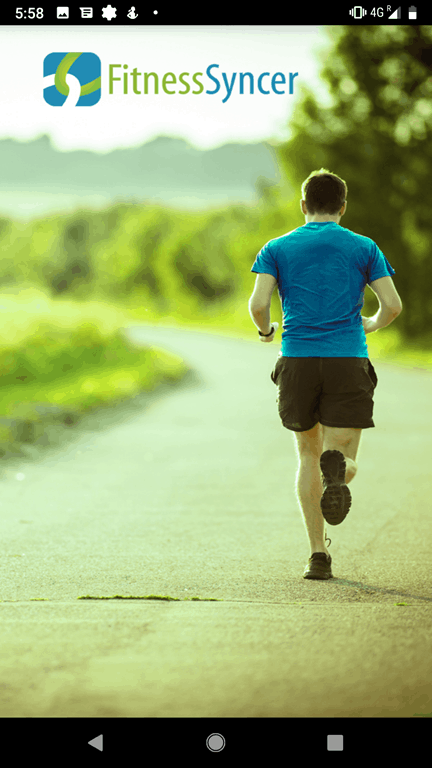 This allows you to record a workout using an app like Endomondo, which supports proper data syncing as well as exporting via a desktop web browser. They sync to plenty of platforms, well beyond just Strava. 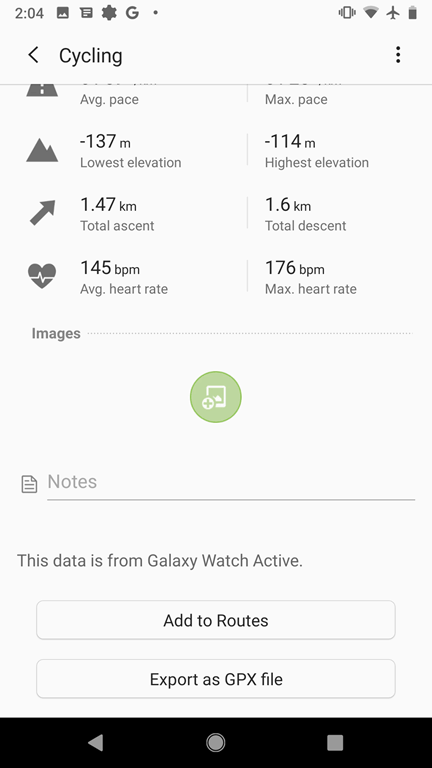 The only downside here is that you won’t get the data into Samsung Health as a cohesive workout picture. But hey – it doesn’t sound like you care about that anyway. I know that DesFit used Endomondo for the vast majority of his review he just released with really good success. I’m planning on using it for the remainder of my workouts for this review. 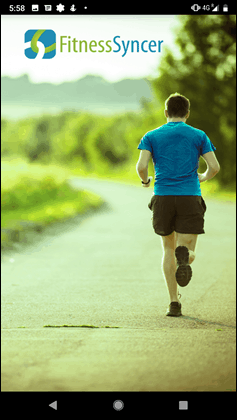 As an iOS user, using it or another fitness app is frankly your best option for file exporting. 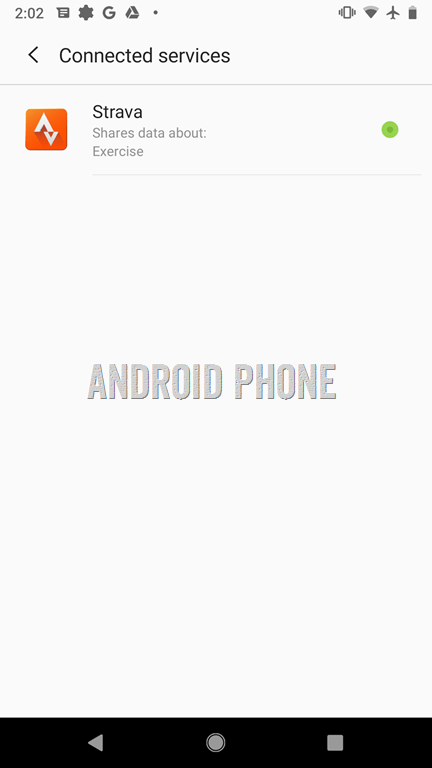 Got an Android friend? 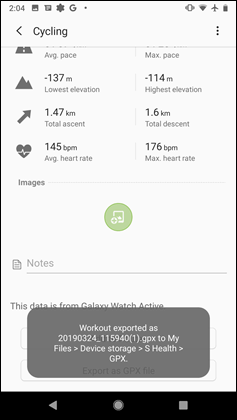 Now, if you do have a friend on Android, there’s some opportunity here if you want to keep using the native workout app on the Samsung watches. Oh, and I mean, like, a really good friend. 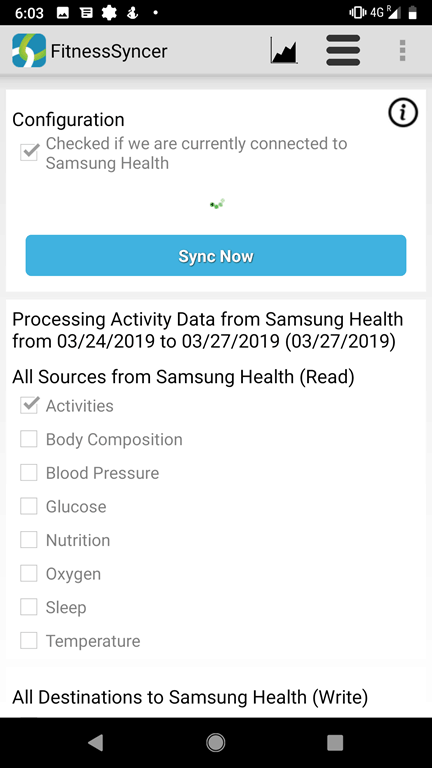 See, the iPhone app syncs up to Samsung’s Health cloud automatically. So all your data is actually there. It’s just that you can’t do anything with it as an iOS user. 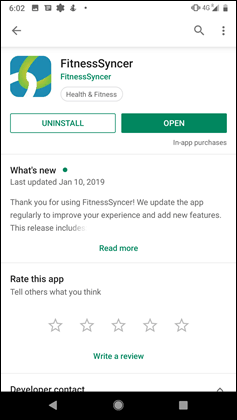 However, if your friend installs on their Android phone the Samsung Health app, and then you log in with your account – then you can sync your workouts automatically down to that phone and export from there. 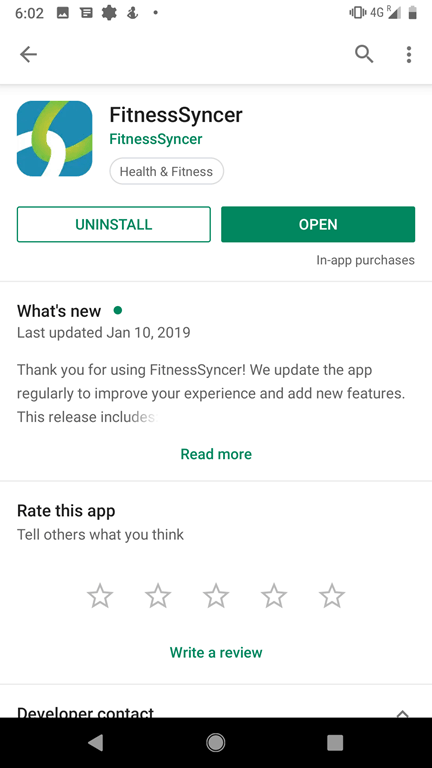 Same goes for FitnessSyncer on the Android phone after installing S Health. In fact, that’s mostly what I’m doing today. My Galaxy Watch Active is paired to my iPhone, and then it syncs via the cloud to my secondary Android phone, where I can then export the data out via FitnessSyncer. It’s hardly ideal, but it’s an option – especially if you’ve got an older Android phone lying around (Fun tidbit though: Samsung Health app won’t let you sign-in the first time without a SIM card in the phone on Android). Lastly – you may be wondering why doesn’t Samsung just offer an API on their website and allow apps to access it that way? Well, they do in fact. It’s just that it’s not viable cost-wise for companies to use it. First, Samsung charges $10,000 for the initial API access, and then they charge on a per read basis for each transaction. In talking to one company looking at rolling it out, the cost for that small app would likely be over $1,200,000 per year based on the load/demand they get. As you might imagine, that’s well into non-starter territory. And I suspect also the reason why we’ve seen every app but Strava disappear from S Health over the past 6 months. Now – if you’ve got any other ways to get the data out, especially for iOS users, I’m all ears! On one hand, some might make an argument that ‘Hey, at least Samsung allows you to connect their watches to iOS. What about Apple that doesn’t allow you to do that to Android!’. And that’s true. But it’s also whataboutism. At the end of the day, Apple isn’t selling their watches to Android users, and as such, they aren’t offering a crappy experience. Given Samsung’s spent money developing not one, but two apps (Samsung Health and the Galaxy watch app) for iOS – they’re showing an investment in catering beyond not just Samsung phones but also beyond Android phones. And while one might also argue that ‘maybe Samsung will add the export features soon’, history illuminates that’s simply not the case. Stretching all the way back to 2017 this issue has been present. In fact, it’s gotten worse since then. 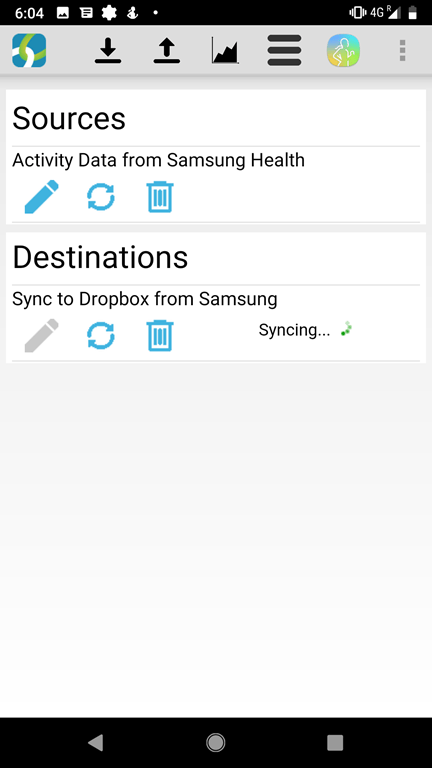 Previously even on Android there were more data sync partners. Now only Strava is left. In the meantime, I’ll keep doing the two-phone and 3rd party app tango to get my data out. Oh – and that final review? Don’t worry, still coming up next Friday as promised. After I find a friend with a Samsung Galaxy phone and fly to another country so I can install the previously always available Spotify app on my watch. Thanks for all the great work and motivation you give! Say you get all the data you want to the place you want. What do you do with all that information to make you a better atlet? Maby a how to guide? Oh, I’m not asking for something super crazy in terms of information. I just want as an iOS user to be able to upload my workout to Strava or export it so I can upload to TrainingPeaks or any other platform. It’d also be nice if the unit actually recorded HR at intervals more than one-minute for workouts (funny since it captures at 1-second for 24×7 data). Uploading the data to Strava through shealth I agree produces strange results. Is much better to use the strava app on the watch. This app its been available since the beginning of the year and avoids potential problems. Why using some other company software in the middle if you can use strava company app directly? Did not mean to inply you wantet something crazy;). I wrote under this post i hope of geting an answer. I mean i generall. If you use a samsung, garmin, apple etc. And you get the data you want. What should you look for in all that data to improve the fitnes of yourself. If i got all my running data on ex Strava. What do i do with all that data? the same for how to export from garmin(-connect) would be cool too! B) On Garmin Connect (website), simply click the little gear/settings icon on an activity and choose which format you want to download in. 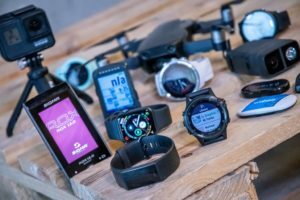 C) On Garmin Connect (mobile or website), link to a boatload of 3rd parties to automatically have your data sent there. Works on iOS/Android/Mac/PC, and heck, I think even still Windows Phone somehow. Those are the big three though. I am just not going to buy any samsung related watches, this is unacceptable! 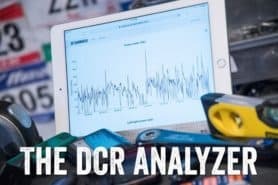 there are actually 2 ways how to get data either straight to strava or download tcx files. There is another app called Gear Tracker, but I don’t have experience with this one. To clarify – in that case (SportWatch for example), that’s acting as an actual workout app – rather than sucking in the data from S Health, correct? So roughly akin to Endomondo in this scenario, but just with more sensor support. … how they will work with iOS. Would you consider this the most smartwatch device you tested? I’m looking forward to the review. From what I saw HR is wacky but GPS isn’t bad. I think Apple Watch is smarter then this one. Can you plug it in as a USB device? I realize most things since the Fenix 2 have some kind of wireless sync, but maybe that’s easier? I don’t have latest Samsung watch, but it’s not possible to do it with Gear S3, so I highly doubt that it would be possible. Hi Ray, is this the reason we’ve not seen a review for Withings Steel HR Sport? 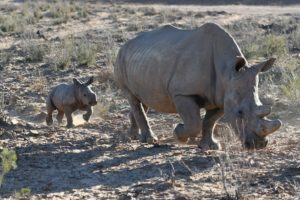 Lack of data extraction? I’d seriously consider it if I could push data to Strava. 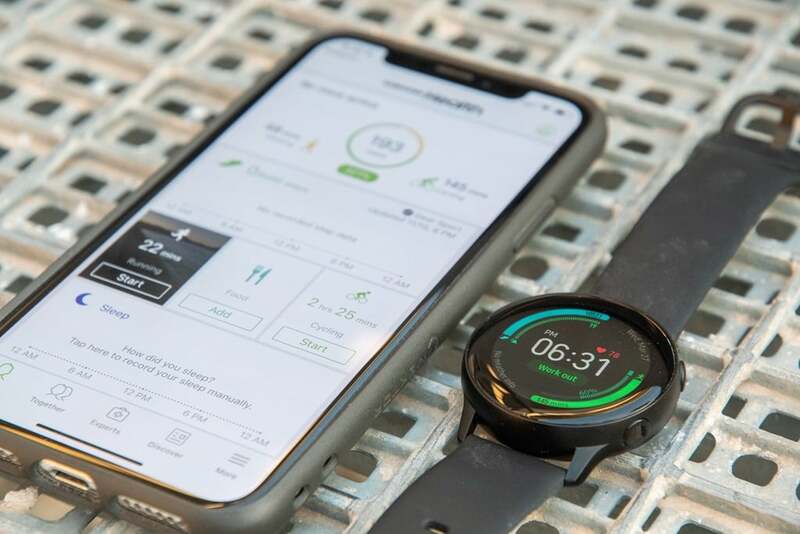 I would like to share some information that might be helpfull for your in-depth review: I purchased a Samsung Galaxy watch two months ago and was really frustrated by the inaccurate HR monitoring and in particular the many and long lasting dropouts during my workouts. I believed, if I enabled “Auto HR –> permanent” everything should work, but it didn’t! There you will find out that the power saving mode for sensor (also HR) is enabled by default! 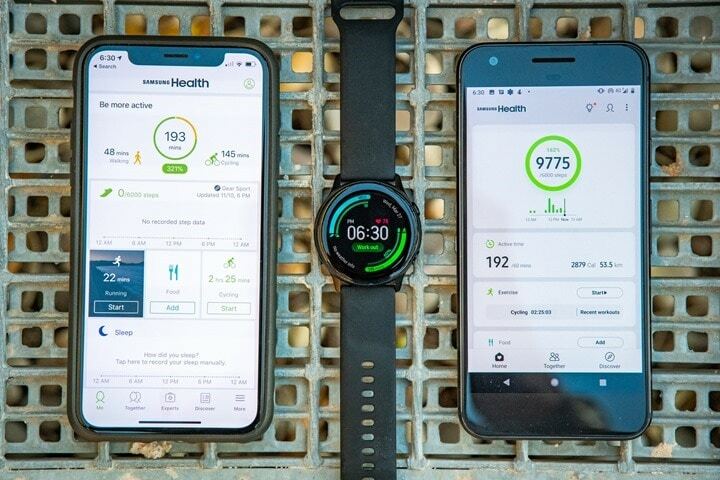 From my point of view this is what causes the issues mentioned above and drives every samsung galaxy watch owner crazy who wants to monitor the HR during excercise. 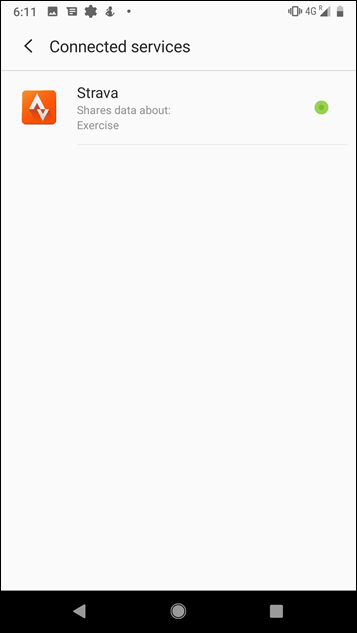 I don’t know why Samsung did that but the fact that neither the support forum nor the hotline knows about the solution is even a bigger mystery to me. However, if you disable this button you will find out that the HR monitoring will work as it is supposed to do. Maybe you can double check and mention it in your review if you make the same experience. Does turning off power saving mode for HR make it more accurate? Huh – I didn’t know about that. I’ve primarily used FitnessSyncer, not SyncMyTracks. How is this even considered a viable device given all the hoops you have to take just to get your data into the services you want to use? Because 99% of the people do not require to export the data in a file in order to make an analysis of the hardware. 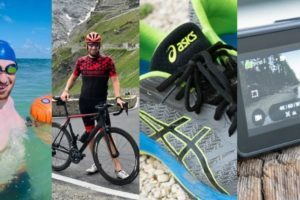 On this watch you have a dedicated app for Strava, Endomondo and others (besides sheath) which give the necessary data for most users. On this site, the needs are different. They make a professional comparison between different watches and the requirements are different. I’d argue that being able to take your activities and history with you to another platform is far more important. If i want to leave Garmin, it is reasonably easy to do so without having to jump through hoops. My experience with the strava app on the Gear S3 wasn’t positive, but potentially it has dramatically improved. I’m talking about exporting your activities into a file (which is not that common). In my case I use Strava and all my activities are recorded there. I can change to any platform without issues (garmin, apple..). I forgot to mention that the strava app had already 3/4 updates and does its job correctly. Of course I did not make any comparison versus other watches so I cannot say if GPS accuracy is good or not. Results seemed normal to me but I’m not an advanced user. That is why I’m looking to read a professional review here!! I’ve been a Fitness Sync user for awhile and it’s a great tool to make sure my data from various sources all end up in Training Peaks. 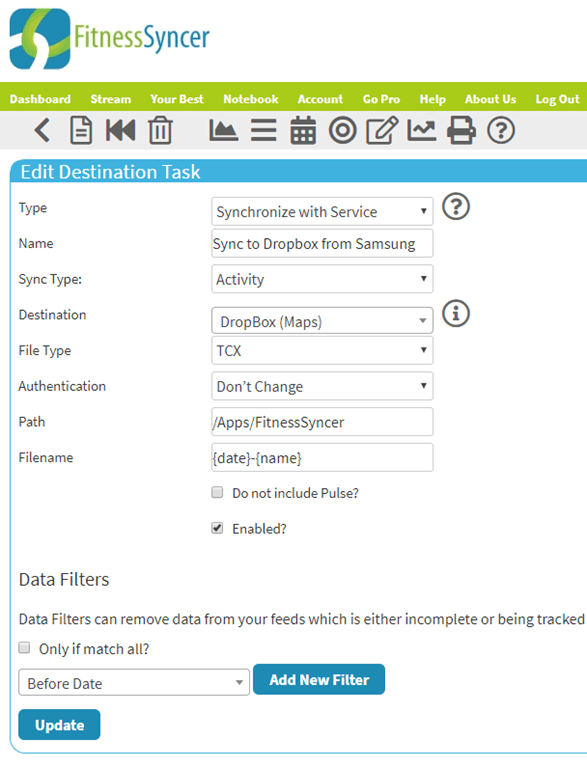 Easy enough to use, supports lots of sources, and can actually do some filtering of data and selective uploads. A good hub to get fitness data from and to multiple sources. Vaguely related is tapiriik dead? This made me think to check my dropbox and Tapiriik hasn’t synced anything to it for quite awhile. I’m not sure on Tapiriik – I haven’t heard much either recently. I try and use the default apps as much as possible for review reasons, since especially with GPS – differing apps can result in differences on accuracy due to processing/etc. Also, for Strava, it doesn’t support that many sports. For example – I can’t use that for swimming. As noted, some sports – swimming for example – is only support in the Samsung app. So, yeah. And I think a lot of folks do use the default apps, especially on the Samsung device. 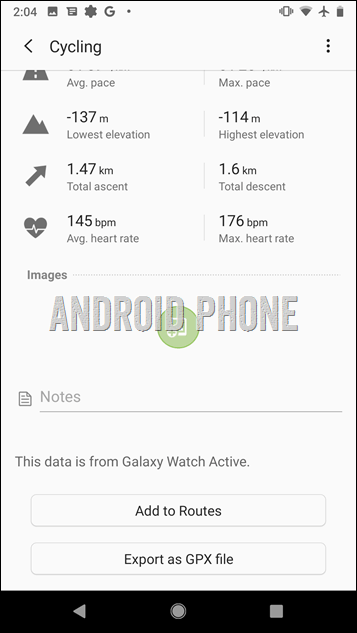 That’s because they have direct links from the stock watch faces as well as also show up properly on Samsung Health. Further, unlike iOS, Samsung actually shows some of these health stats on the home screen of devices, making it even more compelling to use the stock apps. Finally, as you noted – if I used 3rd party apps for all my testing and then found variability with 3rd party apps but had blammed Samsung for crappy GPS or crappy HR, not sure how that’s fair. Ultimately, any company (Samsung, Apple, Garmin, whomever) lies in the bed they made. If they made a crappy 1st party experience, that’s on them to address. There’s no excuse for not having the basics working. I’m trying to figure out how to sync my data from my Fitbit to Google Fit. Step counts, HR, and sleep are what I’m needing. The activities/ workouts aren’t a concern because that syncs to Strava which goes to my health rewards program already. Why does all of this have to be so complicated? My rewards program is RedBrick. Does it work seamlessly from watch to strava? Because after that I can do a lot from Strava, like pair Strava to TrainingPeaks. Sorta. I haven’t spent a ton of time with that app, mostly using Endomondo instead. Have you tried health sync? It syncs Samsung health with google fit. It has some problems related to step syncing but it works for the rest. Thanks for this….I think. 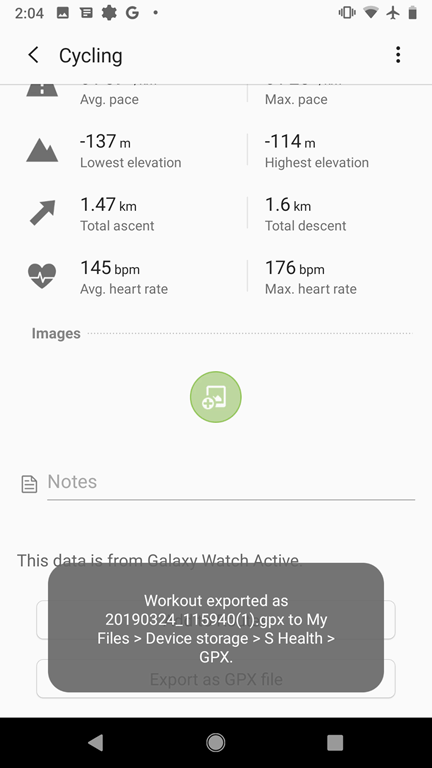 While Samsung Fitness is connected to my Strava account, all workouts come into Samsung Health as Other (except for walking). Thus all of the Strava data (HR, Speed, cadence, power, etc.) 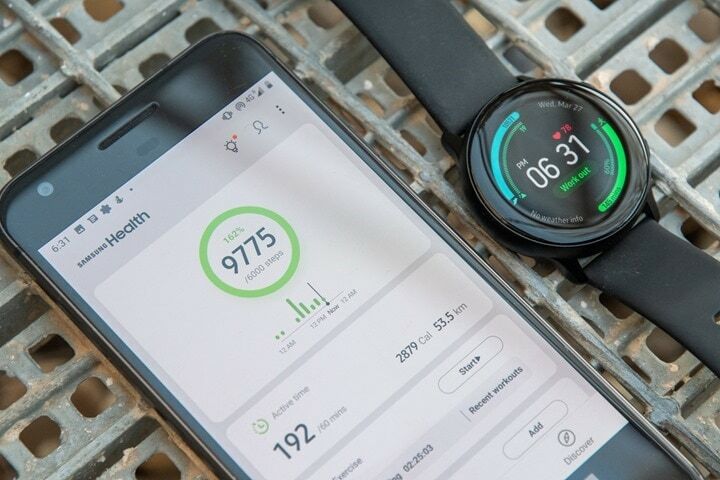 from a cycling workout will appear in Samsung Health, but not be categorized as cycling. To add insult to injury, it often takes 1-3 DAYS for workouts to appear from Strava into Samsung Health. 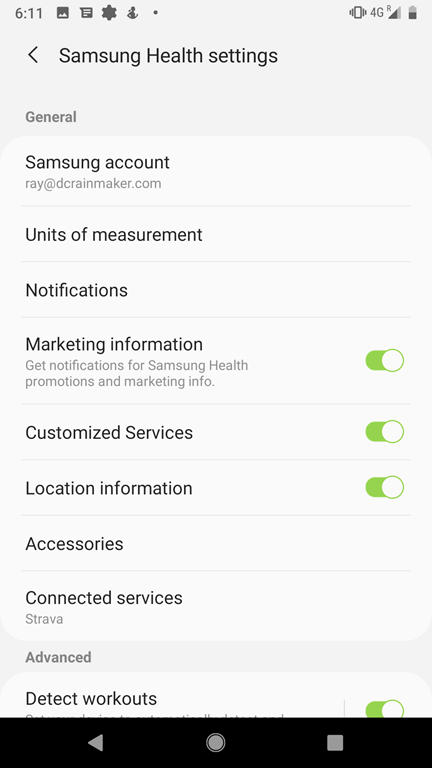 As far as I know, none of the other Samsung Health data (Food, steps, sleep, etc.) is usable outside of the Android app. So ….why use it? I think Samsung have updated their health app recently. I don’t get any option to export a file when viewing an activity. It looks the same as your screen shot of the iOS device. Woah, that’s weird. And I presume that’s an outdoor run with a GPS track? Yeah it was an outdoor run, but there’s something weird about it. In the Samsung health app it shows all the usual stats like total distance, time & pace for each km heat rate etc, but there’s no map. I used FitnessSyncer and transferred it to Strava and it only copied across very basic information like total distance and total time. None of the other data has transferred. So someone on my Samsung Galaxy Active review noted something in that rough ballpark in the comments, whereby there was no GPS track as well. I think something in a recent update must have dorked up the GPS permissions, where it’s not plotting tracks.